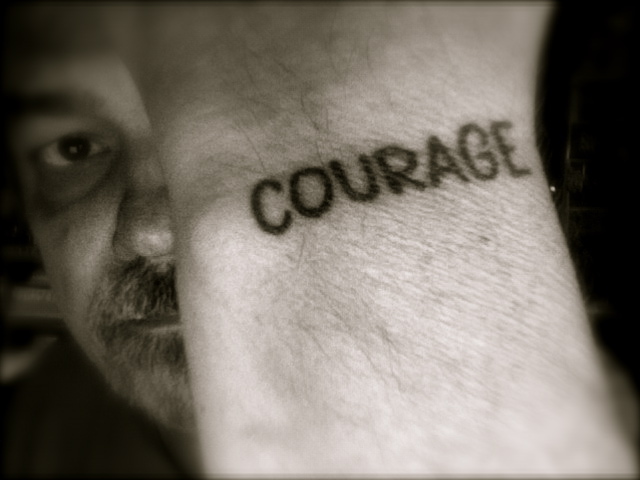 Not long ago my husband had the word Courage tattooed on his wrist in a font that screams J’accuse! each time I see it. When I mentioned his tattoo and my reaction to my therapist, her eyes bulged ever so slightly in that way that says ‘Now this is information we can work with’ before she recovered herself and asked, in the most therapeutic of tones, “Courage…?” This, of course, was intended to get me talking. But I’m a debut novelist, and I’ve learned not to say what I really think. The irony of that last statement is not lost on me. But, really…. What can I possibly say to the workshop leader who, after taking my $125, informs me that only one percent of all writers ever find an agent, and only one percent of those will ever see publication…then smiles? The woman who seeks me out to tell me she doesn’t plan to read my novel because she doesn’t read that kind of book (whatever that means) but then launches into a description of the book she’d like to write. The anonymous “reviewer” who dismisses my novel while giving five stars to the 9 romance novels she (I hope) read that same week. The woman (why are they always women?) who sets my book back on the table after finding there are no “study questions” in the back to guide her. The well-meaning friend who insists that unless I master Twitter, blogs, Facebook, Youtube, and subscribe to the half dozen “social” sites she follows, thus living in front of a monitor until I die, there is absolutely no hope of my book ever being noticed. Remember “Blue Light Specials” at K-Mart? Shoppers were addressed over loud speakers to rush to a section of the store that offered minutes-long special sales on toilet paper, flip flops, or shampoo. And the shoppers ran. Marketing these days is more sophisticated. We run even if we go broke saving money. Apparently J.D. Salinger was so outraged by the world that he holed up in Vermont and occasionally drank his own urine. Name your poison. But I’m beginning to understand why writers drink. This entry was posted in Uncategorized and tagged Amy Poehler, Blue Light Special, book review, book store, Bossypants, debut novel, Facebook, J.D. Salinger, Jimmy Fallon, K Mart, Kafka, KMart, Seth Meyers, SNL, tattoo, therapy, Tina Fey, Twitter, urine, YouTube. Bookmark the permalink.